Welcome to the Save Star of the Sea website. We are a group of Parishioners who have come together in Faith and Friendship to promote the "Save Star of the Sea Redevelopment Proposal" which will ensure a Catholic Church and Parish Hall remain on the historic Church Property in White Rock, BC. When it became apparent that the "Parish Master Plan" was going forward without full consultation and presentation to our entire Star of the Sea Parish Family, we realized it was necessary to form our Group, including a Steering Committee and Advisory Council. In order to defend the promises made over the decades by a succession of Parish Priests that a Catholic Church would always remain within the City of White Rock and that Senior's Housing would be developed, we are promoting the "Redevelopment Proposal" that originated with a group of Star of the Sea Parishioners. It is a brilliant and progressive vision that will be self-funded and fiscally responsible, as well as include all the amenities that we cherish, such as a Church, a Parish Hall, Senior's Housing, and more. To secure and preserve a Star of the Sea Church and Hall in White Rock and promote the Save Star of the Sea Redevelopment Proposal. Blessed Mother, Our Lady Star of the Sea, pray for us. The next meeting will be held on Monday, November 20 from 2:00pm to 3:30pm in the Knights of Columbus Chambers at Star of the Sea Church in White Rock. By now all Parishioners of Star of the Sea Parish should have received the letter from Father Dion dated August 1, 2017. This letter outlines two amendments to the Parish Master Plan, as unveiled at the Parish general meeting on May 12, 2016. "1) The sale and development of the Star of the Sea site in White Rock is put on hold for an indeterminate period of time. When the subject is re-introduced it will be with a strategy that incorporates the input of the whole Parish. Until such time proposals by any company or group will have to wait. 2) The scale and cost of the new Center at the Good Shepherd site will be reduced to a more modest structure designed so that it could be enhanced in future years. At present, the plans will be downsized so that the Center can be funded without any recourse to property disposition in White Rock. The status of the church and property in Crescent Beach is still on hold until such time as the Apostolic Signatura in Rome makes its decision on the appeal to the Archbishop's Decree of Closure. We have not received any time frame for this process, so it's simply a matter of waiting for however long it takes. Once that decision is made known to us, we can respond accordingly." We extend our thanks and gratitude to Father Dion, our Parish Councils and Archbishop J. Michael Miller, who I believe came together for this decision for the good of our Parish Family. We continue our prayers for Archbishop J. Michael Miller, Father Galvon, Father Dion and all our clergy. We pray for our entire Parish Family, remembering that many challenges are faced on a day-to-day basis. We pray for our Parishioners who volunteer their time and efforts in all Councils, Committees and Ministries. Their dedicated service for the good of the Parish is much appreciated. We pray for each other remembering to reach out to all with kindness in all endeavours. As we celebrate this news while enjoying BC Day, let's offer prayers for our firefighters and all affected by the wildfires. We can also help by using the Archdiocesan/Parish envelopes in the special collection being taken next weekend (August 12th and 13th) throughout the Archdiocese. In faith and friendship, may God bless us all. 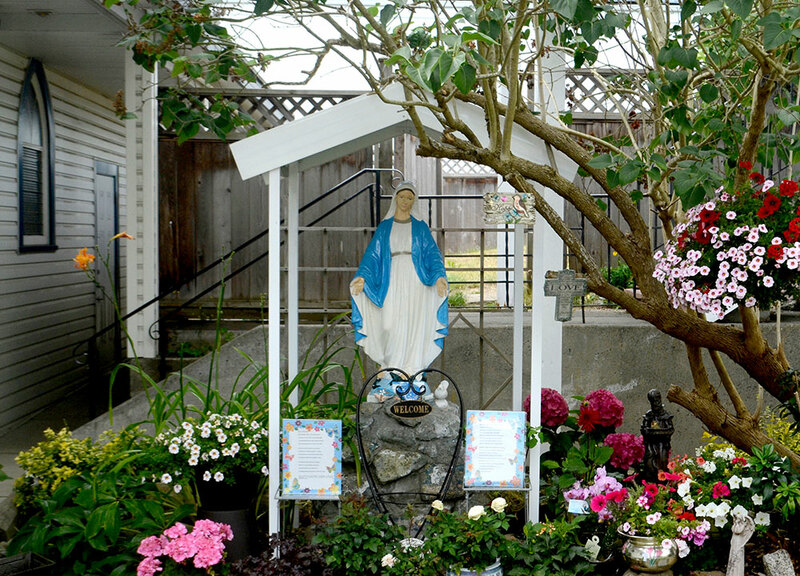 Parishioners at Star of the Sea in South Surrey received notice on April 18, 2017 that the RECOURSE that they submitted to the Vatican against the closure of Holy Cross Church in Crescent Beach was rejected and that the DECREE that was issued by Archbishop Miller was being upheld. The Rejection letter was dated March 28, 2017. Jim Garnett, a representative for several hundred parishioners that are opposed to the closure of Holy Cross Church said that there is shock and extreme disappointment throughout the Parish. The parishioners feel that they were abandoned by their Archbishop when he and the Pastor of Star of the Sea Parish decided to close the church and see the valuable land. Parishioners formed an association several months ago and hundreds of parishioners from all three churches in the Parish paid a membership fee. The association is called "Save Star of the Sea" and has an active website under the same name. Three parishioners in their own names and in their own right submitted petitions to the Parish Priest, the Archbishop of Vancouver and to the Congregation for the Clergy of Rome, only to have them rejected. The Catholic Church requires that parishioners can APPEAL only in their own names and not as a group when submitting APPEALS or RECOURSE to Church hierarchy. The three parishioners have already begun to further APPEAL to the Supreme Tribunal of the Apostolic Signatura, which is the highest level of APPEAL within the Catholic Church next to the Pope. This next APPEAL will require the counsel of an advocate located in Rome and the entire process will cost upwards of $25,000 CAD. Parishioners are already coming forward and offering financial assistance to the three parishioners who are in the process of submitting the APPEAL. The only good news from this process is that the Archdiocese cannot sell Holy Cross Church or property unless the Supreme Tribunal rejects this further appeal. A possible question... What makes you think that another appeal will be successful? Let me just say that the Supreme Tribunal rests the burden on proof that Canon Law was violated on the person that submits the appeal. We received notification that our Recourse Documents supporting our Appeal of the Decree to close Holy Cross Church in Crescent Beach arrived at the Vatican before the deadline as set out for such matters according to Canon Law. Now, we cautiously celebrate the news that these Appeal Recourse Documents to the Decree have been accepted for review at the Vatican. This is another step in the process to secure the presence of our humble and historic Church in Crescent Beach with the desire that it remain open as a place of Catholic worship. From "Richard Rohr Meditation": I offer for contemplation. the following quote from Catherine Mowry LaCugna (1952-1997), a Catholic theologian whose passion was to make the doctrine of the Trinity relevant to everyday life of modern Christians. She is also the author of "God for Us": "The doctrine of the Trinity reminds us that in God there is neither hierarchy nor inequality, neither division nor competition, but only unity in love amid diversity." Please remember your prayers for our Parish Family including many who face overwhelming challenges. During this season of Lent, we assess our Spiritual Journey while watching for opportunities to make sacrifices with kindness and compassion and pray for blessings for all. Although we go under the banner of "Save Star of the Sea," we are comprised of many groups of Parishioners. I want to assure you that we are not just a small group of old ladies that are trying to save our Church. Our numbers are growing. The Parishioners that support us come to our group from all three churches within our Parish including members of Knights of Columbus, Ushers, Eucharistic Ministers, Greeters, Helpers of St. Anne, Readers, Choir Members, and Adoration Chapel participants. All of these hundreds of Parishioners feel that they had no input into the Parish Master Plan prior to it’s development, presentation and acceptance by the Archbishop. From the time of the Annual General Meeting. May 12, 2016 with the unveiling of the Parish Master Plan, we have come together in the hopes of swaying the determination of our Parish Committees to push forward this Parish Master Plan at the expense of two historic Churches within our Parish. These Parish Committees have met with the Archbishop and in spite of this flawed process and some misinformation have received approval from the Archbishop to SELL both the Holy Cross Church site AND the Star of the Sea Church and Hall site. Members of our Parish Knights of Columbus, seeing the potential of keeping these Churches within our "Cluster Parish" worked diligently to develop an alternative to "disposing" of the two Churches. As a Group, we promote and support this Redevelopment Proposal. The majority of our Parish Knights of Columbus support this Redevelopment Proposal. In spite of repeated requests over a two year period, the Archbishop has not reached out to at least view what would be a brilliant option of keeping our churches within our Parish, generating revenue for our parish and including much needed Senior’s Housing. The inclusion of Housing for our Seniors has been a long standing promise in our Parish. When we initially started meeting, we felt we had no recourse to save Holy Cross Church, as that is what we were told by the Parish Committees responsible for the development of the Master Plan. We have since come to realize that not one Parishioner is more important than the other and not one Church within our Parish is more important than the other. We must stand up for each other as each Spiritual Need is important and must be defended. The tragedy of this matter exists in how many souls have already been affected. The sense of betrayal has caused some to leave our Parish altogether, to the Anglican Church or to other Catholic Parishes in the Diocese. Such imprudent decision making has scarred parishioners deeply and violated the sacred trust relationship that is desired in Church relationships. Today was the date scheduled for the last Mass to be celebrated at Holy Cross Church in Crescent Beach according to the Decree sent from the Archdiocese. Three Parishioners of our Group, signed the Appeal to this decision. Fortunately, this Appeal was received by the Archdiocese within the allowed time line, and so the 8:30am Sunday Mass will continue to be celebrated indefinitely. We celebrate this reprieve and pray for a successful conclusion. This Decree and subsequent Appeal are parts of an overall process that continues. We need to STAND UP and BE COUNTED. To this end we have embarked on a MEMBERSHIP DRIVE. For further information, call me, Alicia at 604-536-5634, or e-mail me. After Mother Teresa (now Saint Teresa) died, this handwritten note was reportedly found on the wall of her room. Leave us your comments and let your voice be heard!